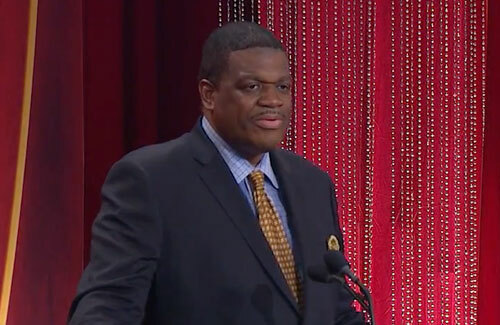 In 2013 Bernard King was elected to the Naismith Memorial Basketball Hall of Fame along with inductees such as Rick Pitino and Gary Payton and on Sunday, September 8, 2013, the former New York Knicks and Washington Bullets forward was inducted into the Naismith Memorial Basketball Hall of Fame. Photo shows former New York Knicks and Washington Bullets forward, Bernard King, delivering his Hall of Fame speech after induction into the Naismith Memorial Basketball Hall of Fame Sept. 8, 2013. King played 14 seasons with the New Jersey Nets, Utah Jazz, Golden State Warriors, New York Knicks and the Washington Bullets. During the 2006 NBA All-Star Game, a panel of basketball analysts for the TNT network selected Bernard King as one of nominees of the “Next 10”, a list of 10 unofficial additions to the NBA’s 50 greatest players list in honor of the NBA’s 60th anniversary. He now works as a part-time broadcaster for NBA TV as well as the MSG Network, filling in on some occasions as color commentator when Walt Frazier is on vacation. Sports Speakers 360 is a booking agent for motivational sports speakers. If you would like to book athletes like Bernard King for a speaking engagement, autograph signing, guest appearance, product endorsement, charity fundraiser or corporate event, contact our booking agent for appearance and speaker fees or call 1.855.303.5450.